Early “contemporary” music: Ensemble Schirokko Hamburg presents its own arrangements of French baroque music. 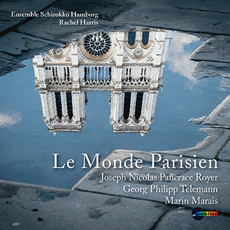 Under the leadership of violinist Rachel Harris, Ensemble Schirokko Hamburg twice bridge the gap to Paris in their new disc, “Le Monde Parisien”. The musicians accompany the Hamburg grand master Georg Philipp Telemann on his journey to the great city on the Seine, where (thanks to his musical visiting card the “Paris Quartets”) all doors were opened to him. Composed so ingeniously that they quickly spread throughout Europe, two of these Nouveaux Quatuors can be heard on this disc. The Hamburg-based ensemble bring a unique souvenir in their luggage: French baroque chamber music gems by Marais and Royer appear in a new light in the orchestral arrangements by Rachel Harris. Pieces where thereby sought out which in themselves invite the mind on a journey around the world: the “Suitte d'un goût Etranger” by the viola da gamba virtuoso Marin Marais refer to foreign lands and customs just as the virtuosic harpsichord composition “La Marche des Scythes” by the scarcely known Pancrace Royer. With their own version of these findings, the ensemble invites the listener to join them on an entertaining journey through foreign worlds and ages.